If the weather where you are is as cool and rainy as it is in Philly right now, you’ve definitely landed on the right recipe. There’s something about this weather that really gets me craving something warm and hearty, a big bowl of comfort, basically. Because let’s face it – I’m all about the comfort food. 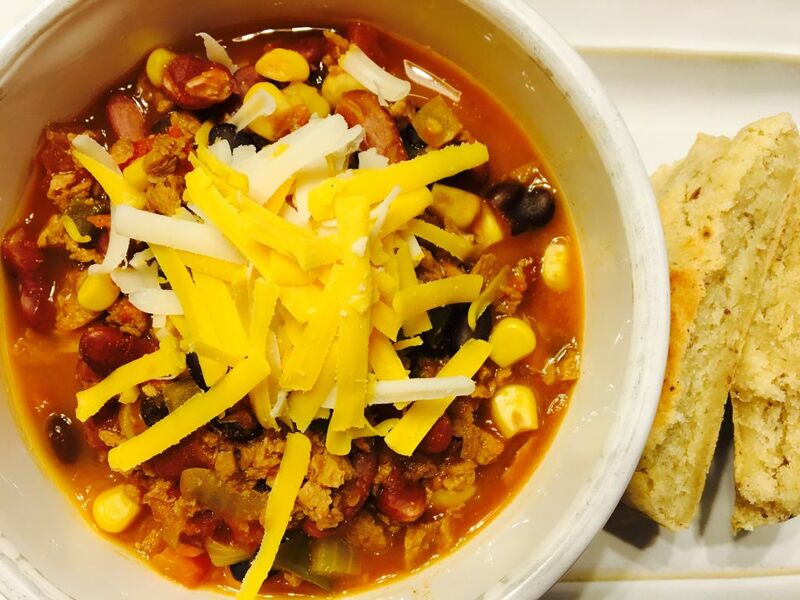 This is one of the recipes that can be found in our FREE Steamy Kitchen E-Cookbook along with a corn cake recipe that accompanies this chili perfectly. If you haven’t already, make sure you grab your copy! Cook dry beans (or pull cans from the pantry). In large pot, saute onions, carrots, and peppers in a Tbsp of coconut oil for about 3­5 minutes on medhigh to high heat. Add tomatoes and seasonings. Stir. Let simmer – covered – for approx. 30 minutes, stirring occasionally. Add corn and beans and simmer – covered – for another 30 minutes, stirring occasionally. Top with fresh cilantro and/or scallions, Tofutti sour cream, and your favorite non­dairy cheese shreds. Watch us make this recipe LIVE on Periscope!